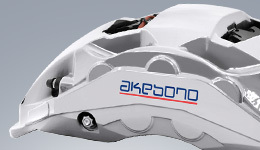 Diversity Initiatives | With Our Associates and Their Families | Stakeholders | Corporate Social Responsibility (CSR) | Akebono Brake Industry Co., Ltd.
Akebono is engaged in diversity management with the aim of creating a workplace in which associates with diverse values can develop their potential. Akebono aims to strengthen its corporate capabilities in a way that reflects the high respect it has for the values of each associate and their diversity. The Company cherishes associates’ individual aspirations regarding work and life so that each can develop their creativity in the course of their duties, which, in turn, will help bring about a more vibrant company overall. Akebono is promoting diversity because it recognizes that as it expands globally, it is becoming increasingly important to establish a corporate structure that helps each associate realize their full potential regardless of their value system or cultural background. To further promote diversity, the Company is promoting recruitment activities that target people of all nationalities. 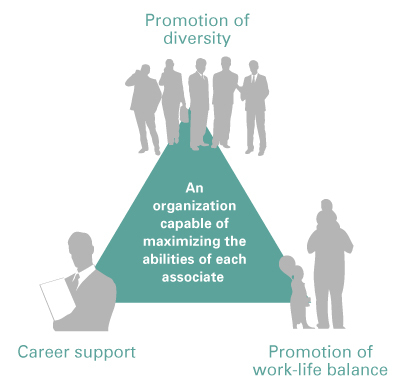 Akebono is promoting diversity management centered on three key initiatives, namely, diversity promotion, career support, and work-life balance promotion. Akebono will work to double the number of female managers from 2014 levels by 2020 through further diversity promotion efforts going forward. Akebono will continue working to be a company where all of our associates can work with motivation and enthusiasm, regardless of gender. 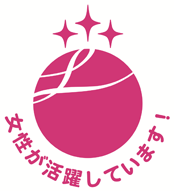 In April 2016, we received the L-boshi Designation (Third Grade)* from the chief of the Saitama Labor Bureau. The L-boshi designation system recognizes business owners that have performed excellently in initiatives for promoting the advancement of women from among those who formulate an action plan based on the Act Concerning Promotion of Women's Career Activities and submit the details of the plan. The designation is received from the Minister of Health, Labour and Welfare. There are five evaluation criteria and accredited between grade 1 and grade 3 based on a result of the evaluation. Akebono achieved the top rank of Grade 3. * Official nickname for the designation of the General Business Owner Complying with the Standard based on the Act for Promoting the Advancement of Women. Not only does Akebono proactively accept interns from abroad, it also organizes exchange events where interns and associates find their sense of being part of an international concern nurtured through the exchange of ideas. In fiscal 2012, the Company began holding such events under the title “Internship Forums.” In 2014, the forums were revised to enable participation from associates on assignment at Group companies and trainees as well. In conjunction, the name of the forums was changed to “Ai-Forums,” and the content was changed to encourage deeper mutual understanding by introducing each country (industries, culture, work style, etc.) and having question-and-answer sessions. Around 100 people have attended the program so far. 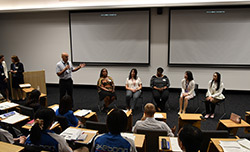 At the Ai-Forum held in May 2016, a panel discussion was held on the topic of “Women Building Careers in the Automobile Industry.” Five female managers from different locations were the panelists. Both male and female associates enthusiastically participated in the activities that day, talking about career advancement and mutual understanding. The event also served as an opportunity to forge new connections with people as advice was given about how to deal with hardships at work and how to balance work and family. At the same time, we are focusing our energies on nurturing personnel able to work in global settings by providing associates with opportunities to come into contact with a variety of value systems overseas. 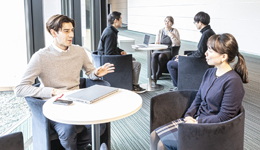 Akebono 123 Co., Ltd., a special-purpose subsidiary of the Akebono Group that provides employment for people with disabilities, is working to help them achieve personal growth through duties. In April 2016, Akebono was designated as an Excellent Employer of People with Disabilities in Saitama Prefecture for a fourth consecutive year (10th time). The prefecture recognized Akebono’s proactive initiatives to create workplaces where people with disabilities can use their abilities. In addition, at the 2017 Saitama Prefecture Work Fair for the Elderly and People with Disabilities, Akebono 123 associates received an outstanding worker with disabilities award from the Saitama Prefecture Employment Development Association. 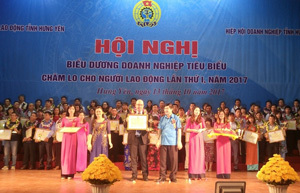 The award is presented to outstanding workers who overcome their disabilities to perform as exemplary professionals for at least five years. At the same time, the associates were also awarded the Chairman’s Incentive Award from the Japan Organization for Employment of the Elderly, Persons with Disabilities and Job Seekers in the Disability Employment Support Month poster design category. 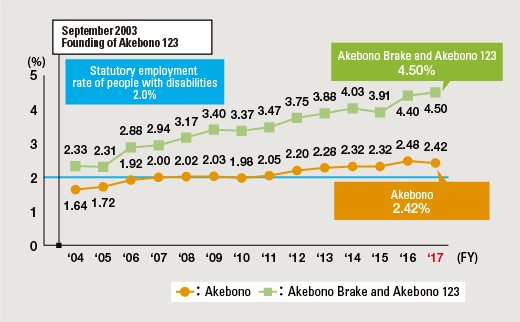 Akebono’s employment ratio for workers with disabilities as of the end of fiscal 2017 stood at 2.42%, higher than the statutory rate of 2.0%. In September 2017, Akebono 123 celebrated 14 years since its establishment. Initially, there were five associates responsible for cleaning tasks, but gradually the number of associates and their scope of work have increased. Currently, the tasks they are responsible for have expanded to include printing business cards, document processing, refilling paper in copy machines, scanning design drawings, and packing parts at manufacturing sites. 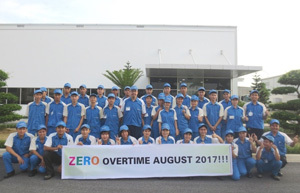 Moreover, our subsidiary Alocs Corporation has subcontracted its packaging tasks to Akebono 123 since 2008 and continues to have a perfect track record without any customer complaints. Measures are implemented to reduce errors, such as the use of photos and providing verbal instruction. We will continue to equip our associates with better skills and expand their scope of work to aid in improving the competitiveness of the entire group. 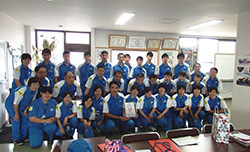 In addition to helping our associates, we are also engaged in activities in cooperation with the Hanyufuji Special Education School “to maximize the skills and unique characteristics of each and every student aiming for 100% employment.” These efforts earned us an “Excellent” distinction at the 2017 Saitama Prefecture Practical Career Education Awards. Akebono’s special subsidiary company, Akebono 123, accepts trainees from among the students at special education schools in Saitama and Gunma Prefectures in an effort to support each individual’s social and occupational independence. In fiscal 2017 four students from three schools received training for a total of 100 days. The workplace observation was attended by 98 students from two special education schools and 55 students from eight other support organizations and special subsidiary companies. It is used as a reference example for logical consideration of improvements in addition to associates’ workflow. We will continue to fulfill our corporate social responsibilities geared toward the future independence of students. 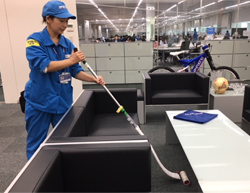 In our everyday efforts to make it easier for associates to carry out their jobs, we fabricated a cleaning tool, the “Snake Korokoro” (snake roller). It received the Grand Prize in the 15th annual “Building Cleaning Idea Goods Awards” held by the “Monthly Building Cleaning” journal (featured on page 11 of the December issue of “Monthly Building Cleaning.”) The Snake Korokoro allows you to safely clean carpets under low tables and chairs without damaging the furniture or bending your back. Our efforts to make improvements aiming to create a more associate-friendly work environment will continue. Since fiscal 2015, Akebono’s Diversity Implementation Office has engaged in activities that support career advancement, such as networking, Dream Map Workshops, and opportunities to talk with directors. Through these ongoing activities, we aim to evolve the entire company into an organization where each and every associate can maximize their abilities. Forming connections among female associates establishes a platform that can help resolve anxieties and issues related to work. A part of career training, these workshops help associates visualize their future targets (dreams) and clearly define their ideal career. Creating venues for associates and directors to discuss matters and obtain views and advice from different perspectives helps broaden the horizons of all associates. A diversity promotion site was added to Akebono’s company intranet in November 2016. In addition to featuring a message from the president regarding promoting diversity, it is a place to share diversity promotion activities. In the “Careers” section, the careers of diverse members of our personnel are introduced along with a motivation graph. This effort helps to communicate the message that there are many different careers available and aids in cultivating a diverse work force. With the aim of accommodating the various workstyles of each associate, Akebono has designed various programs for associates raising children and those caring for family members to assist them with their efforts to strike a balance between these obligations and their work. For example, we have designed various programs for associates raising children and those caring for their family members to assist them with their efforts to strike a balance between their work and family obligations such as childcare and nursing care. Some of these programs allow eligible associates to shorten their working hours by up to 2 hours per day or take leave for childrearing and nursing care. Others include loans to help with nursing care fees or assistance with home visit care fees. Moreover, we also offer a Career Partner Plan that allows the reinstatement of those who left Akebono due to family circumstance such as childcare, nursing care, or overseas posting of a spouse. We also support associates' career development efforts while offering opportunities to participate in self-improvement activities. We distribute Life Supporter, a booklet that summarizes the content of these and other programs with the aim of facilitating the utilization of the programs by associates. Going forward, we will also implement forward-thinking initiatives with an eye to future issues, thereby securing a corporate structure responsive to issues and changes in the social environment. To create a working environment that offers diverse and flexible working styles, we will continuously enhance these programs by incorporating feedback from associates. 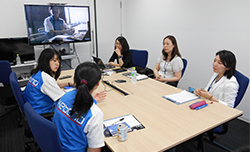 Twice a year, Akebono holds a “Child-rearing Information Exchange” session for pregnant associates and those on childcare leave. 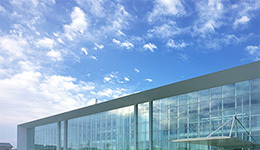 It serves to strengthen the connection between the company and its associates by sharing the latest company news and topics as well as prepare associates for a smooth transition back to work through an understanding of the company’s childcare system and the exchange of information among employees. Both male and female associates participate in these sessions. 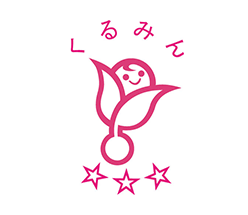 In October 2016, Akebono Brake Industry received the "Kurumin" mark from the Saitama Labor Bureau, recognizing it as a company that actively supports child-raising in accord with "the Act on Measures to Support Development of the Next Generation." The company received this award in November 2007 and June 2013, making this the third time that Akebono has received the award. Child care leave plan Associates can take leave until the March after the child’s third birthday while receiving aid. This can be taken in multiple parts. Note: Akebono has a child care leave plan that exceeds legal standards. Career partner plan A program that provides those who left the Company due to family duties with opportunities to later rejoin Akebono within five years after their resignation. Eligible associates include those who had served for a continuous period of three years or more before leaving and meet other prescribed criteria. Child nursing care plan Associates can take up to five days of leave per year (ten days for associates with two or more children) to nurse sick or injured children or for children’s doctor visits until the child graduates from elementary school. This leave is separate from annual paid leave. - Reduced working-hours plan: Associates can use the system multiple times until children graduate from elementary school. - Reduced working-hours plan: Associates can work reduced hours for a total of up to three years per family member to provide nursing care. These can be taken in multiple parts. - Training for new managers regarding the need to consider employees’ balance of work and home life. - Provision of useful information for balancing work and home life through pamphlets and the Intranet. 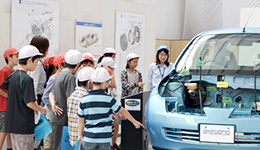 - Akebono Visit Day was held each year during children’s summer holidays to give associates’ families a chance to visit the workplace. Medical leave system Associates receive 12 days of medical leave per year in addition to their annual paid vacation, so they can recuperate from unforeseen illness or injury without worrying about work. Work interval plan Ensure that long working hours are rectified, and associates get sufficient rest time by leaving 11 hours free from the end of work to the start of work on the next day. We have a childcare leave plan that exceeds legal standards. For example, eligible associates can apply for childcare leave until the child's third birthday. Eligible associates can shorten their working hours by two hours per day until the child's enrollment in junior high-school. Moreover, eligible associates can take up to five days per year of leave that is separate from annual paid leave to nurse sick children. 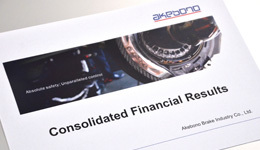 For those who leave the company due to family duties such as childcare, care giving, accompanying a spouse on a regional assignment or for other reasons, we offer a Career Partner Plan that provides them with opportunities to rejoin Akebono and make full use of their experience and knowledge. We are developing work systems that allow associates to choose diversified and flexible work styles as well as a work environment in which each associate can use their skills.